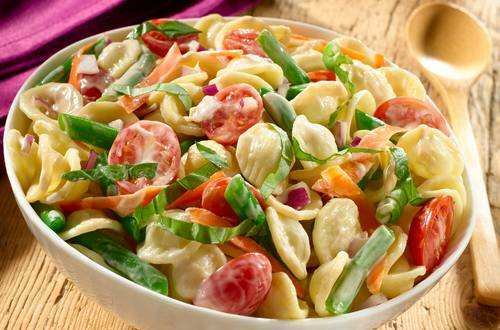 A creamy balsamic pasta salad is the perfect complement to any barbecue, party or family gathering. Try it with any combination of vegetables and don't forget the balsamic vinegar! 1 Cook orecchiette according to package directions; drain and rinse with cold water until completely cool. 2 Combine pasta with remaining ingredients in large bowl. Add salt and pepper to taste. Chill if desired.